Odd Similarities: Are the Eagles the New Colts? There’s been one NFL team for most of the last decade that employed steady stars across the offensive skill positions, including a top five quarterback with special intangibles, two Pro Bowl-caliber wide receivers, and a cadre of complementary weapons for their pass-heavy system. This team had a speed-oriented but relatively simple 4-3 defense with lots of player turnover. And the overall system, touted for years by a steady veteran coach, was in place for season after season as the team won multiple division titles and always pushed closer to the Super Bowl — before finally making it over the hump. I’d ask you readers what team I’m referring to, but my title probably gave it away. The Indianapolis Colts, with Peyton Manning, Marvin Harrison, Reggie Wayne, and others were one of the best teams of the 2000s. After 10 victories in Tony Dungy’s first year as coach in 2002, the Colts won 12 or more games for the next seven years. Perhaps this is a stretch (and feel free to call me out on it if so), but in many ways haven’t the Eagles become a mirror image of those Colts teams? Start on offense. 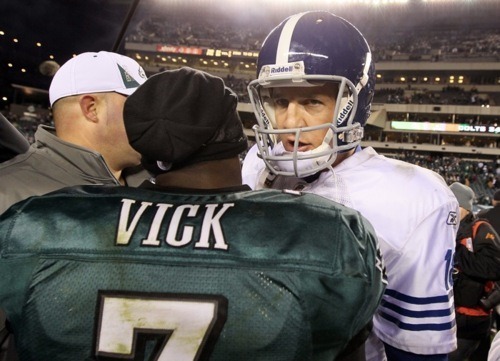 Clearly, Michael Vick isn’t the same type of quarterback as Manning, but both are dominant stars at the position that make defenses adjust to them. DeSean Jackson and Jeremy Maclin are the new Harrison and Wayne. LeSean McCoy can be Edgerrin James and Brent Celek can grow into Dallas Clark’s shoes. Along the offensive line the Eagles now have the same “genius” position coach in Howard Mudd — so presumably that unit will start looking similar. On defense the Eagles are apparently moving away from the complex blitzes of Jim Johnson to the opposite read-and-react style that marked Dungy’s defenses for years. New defensive coordinator Juan Castillo has praised Lovie Smith’s work in Chicago, and the Bears defense is derived from Dungy’s Tampa Two. That new philosophy should fit the Eagles personnel fine since the Colts have cycled through young linebackers at almost the same rate. NFL teams are built in all sorts of ways, and it would have been difficult in the past to characterize these two teams as particularly similar. Suddenly though, there are these similarities and coincidences. And I don’t think it’s a bad thing. I’ve always admired the Colts from afar for their strategy, as well as for the consistency of their success. Part of that success comes from an adherence to one of Football Outsiders’ basic principles: “Offense is more consistent from year to year than defense, and offensive performance is easier to project than defensive performance.” Colts GM Bill Polian built a consistently above average offensive unit from Manning on down, and then allowed the defense to shift around and eventually luck into a few good games in a playoff run. Intentionally or not, the Eagles front office seems to have replicated that formula. Over the last few years they’ve focused on building a formidable offense for the foreseeable future and then started searching for defensive solutions. While the past is written for those Colts, it remains to be seen what kind of future this team has going forward. Tagged with Philadelphia Eagles, Indianapolis Colts, Michael Vick, Peyton Manning, Super Bowl, Marvin Harrison, Reggie Wayne, DeSean Jackson, Jeremy Maclin, Howard Mudd, Juan Castillo, Tony Dungy, Andy Reid, Football Outsiders, Offense. May 25, 2011 by Brian Solomon.